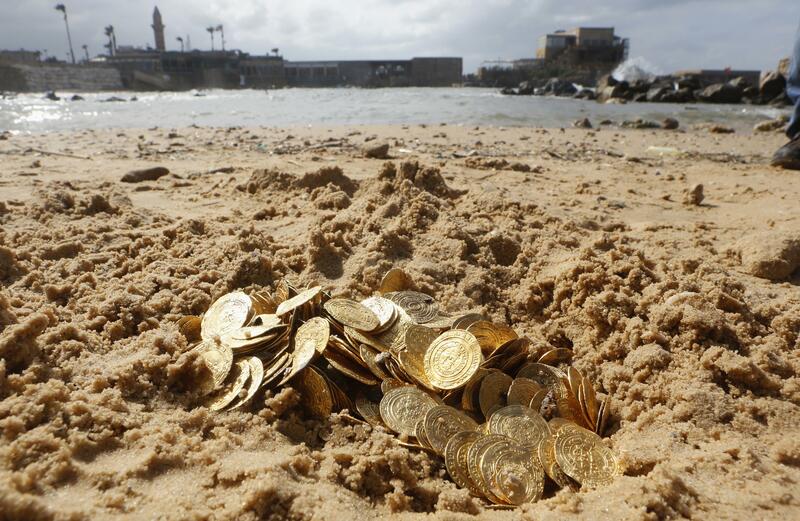 Divers find gold coins in Mediterranean off Israel coast, get nothing. Earlier in February, some members of an Israeli scuba-diving club recently had what is literally one of the most amazing possible human experiences: They randomly discovered a giant underwater ancient treasure in the form of some 2,000 gold coins that are 1,000 years old. Then they had one of the most quintessentially depressing and common human experiences: Some bureaucrats came along and ruined everything. The divers in the port city of Caesarea, which dates back to Roman times, found the coins on the Mediterranean seabed. “At first they thought they had spotted a toy coin from a game and it was only after they understood the coin was the real thing that they collected several coins and quickly returned to the shore in order to inform the director of the dive club about their find,” [the Israel Antiquities Authority] said. Experts from the authority called to the site uncovered “almost 2,000 gold coins in different denominations” circulated by the Fatimid Caliphate, which ruled much of the Middle East and North Africa from 909 to 1171. Whaaaaaaaaaaaat? No way!!! No way, buddy!!! I don’t know what Israeli law or international maritime conventions say about this kind of thing, and I don’t care—if someone discovers a giant ancient sunken treasure, they get to become a rich person. That is how it should work.